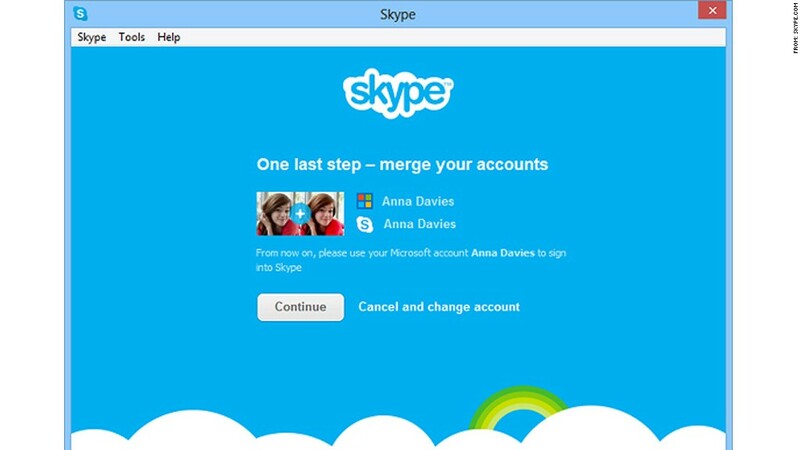 Microsoft is urging Windows Live Messenger users to integrate their accounts with Skype. The company announced its plans to discontinue Messenger in November, but Microsoft sent a firm timetable to its users through e-mail on Tuesday. Microsoft (MSFT) is directing customers to sign in to Skype with their Windows Live login information, noting that their contact lists will automatically show up in the Skype software. Microsoft bought Skype in 2011 for $8.5 billion, but its integration with the Internet communications system has been a bit of a slog. Skype has a Windows app, but curiously, it lacks a Windows Phone 8 app -- even though it offers an app for iPhone and Android devices. A preview version of a mobile Skype app for Windows Phone is in the works and will be available "soon," according to the Skype team. The Windows Live Messenger service has faded in popularity as Skype, social networks and Google's (GOOG) chat service became a more common way of communicating with friends and family. Three years ago, Microsoft said the service had more than 300 million users, but it maintains just a third of that customer base today.